Solicitor and co-founder of transcription services provider DictateNow, Maxine Park recently explained to the readers of Estate Agent Today, the importance of recording meetings and interviews in preventing any potential employment tribunals from occurring. One of the UK’s largest estate agent websites, Estate Agent Today is aimed at individuals working within the property industry, specifically estate agents themselves. The website offers its readers daily updates and news on all topics relating to the property industry, as well as delivering supplier/product information to its users. Maxine’s article highlights how handling sensitive meetings and interviews badly can result in serious legal action being brought against your company, and how recording proceedings froms tart to finish can protect you against any such claims. With over 10,000 reads, the article can be found on the Estate Agent Today website. Employment tribunal fees could soon become extinct, after the Supreme Court ruled they were an obstacle to the ‘access of justice’. Once the government officially removes the fees, the number of claims is expected to increase, as those who would have been deterred by court costs now face no such pressure. Facing this increased risk means organisations should press record more often. 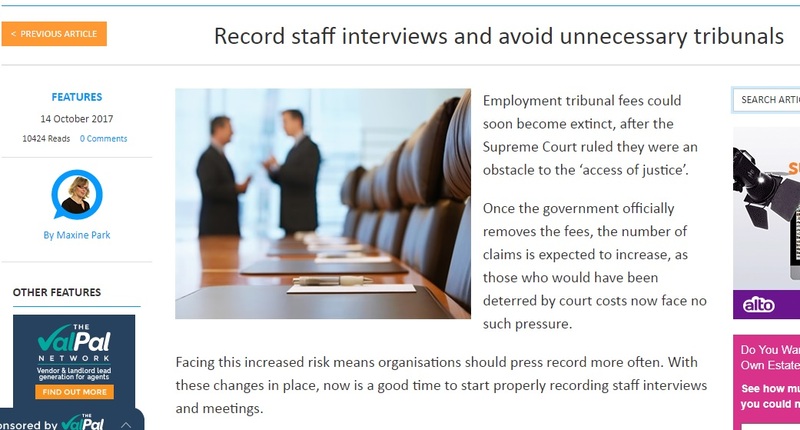 With these changes in place, now is a good time to start properly recording staff interviews and meetings. Although an initial disciplinary matter may be dealt with informally, with a quiet word off the record, once the need for formal proceedings is established, it is very important that organisations follow the policies in place to stop the situation spiralling out of control. Not following set procedures and policies when it comes to disciplinary or grievance interviews can lead to a whole host of issues, including the risk of employment tribunals, with claims of unfair dismissal or breach of contract being brought against your business. Such issues can be easily avoided by simply adhering to the policies in place – this is why organisations of all sizes have started recording job interviews and meetings to ensure accurate recordings are created and retained. It is best practice to inform all parties that a meeting or interview is being recorded, that way those involved can easily access information from the meeting, while protecting your company from claims that you were uncooperative or disruptive throughout. Recordings capture every word, so it is essential those managers tasked with undertaking disciplinary and grievance interviews etc., understand the correct procedure and stick to it, even in the face of provocation. What’s more, knowing a meeting is being recorded can help keep emotions and feelings in check, protecting both parties from being on the receiving end of an unpleasant rant. Sound recordings also help address the common accusation that the manager failed to keep an open mind about an employee or situation until all the evidence is heard. The recording captures every word and syllable, while showing the tone of voice in which certain sentences are spoken. This unbiased way of recording a conversation ensures that opinion or feelings do not creep into the frame, which can sometimes happen when retyping notes made from the meeting. Using a Dictaphone to record meetings or interviews can also speed up the administrative process, eliminating the need for typing up recordings afterwards. This would then have to go through several rounds of amendments and checks by either party, until an agreement can be made on the exact content of the meeting. Another common complaint of employees is that the manager or senior member of staff failed to give them adequate time to voice their full opinion, instead dominating the discussion to eliminate the opportunity for a fair conversation. Again, the knowledge the meeting is being recorded will help ensure managers act appropriately and give adequate opportunity to the employee to put their case across. The recording and subsequent transcription can also be useful to refute any accusation that the employee was not afforded sufficient time. These recordings can also be used internally for training purposes, offering organisations an opportunity to review the meeting or interview and make necessary changes to procedure or policy based on how it was handled. For larger organisations, with an expectation of more such interviews, often with multiple attendees, transcription service providers can supply conference-style recording equipment, with multiple microphones. These help capture an accurate record of multiple speakers, even when they all talk at the same time. Although disciplinary hearings may sound like a negative thing, if they are conducted professionally and all policies are followed correctly they can actually help protect your business from hearsay and workplace gossip that comes from not dealing with an issue quickly and efficiently. By taking the decision to properly record meetings and interviews, you are demonstrating commitment as a company to serving all parties fairly and treating everyone equally, with no ‘your word against ours’ approach present.